A Daytona Beach assisted living facility was recently forced to shut its doors to new residents after an investigation found that administrators failed to report two instances of abuse at Ocean View Manor. The facility may not be the only one in which elder abuse goes unreported, bringing to light how important it is for families to question signs of abuse and neglect, and what steps to take if you suspect it’s happening. Residents in a Medicare and/or Medicaid-certified home do have certain rights and protections under federal and state laws, including rights to be free from abuse and neglect. If a resident feels he/she has been mistreated or the nursing home isn’t meeting his/her needs, they are encouraged to report this to the nursing home administrator. Administrators have five working days to report to proper authorities, fill out a complaint form, and address the issues promptly. But this was not the case at Ocean View Manor, where a former cook was seen several times by staff and visitors in a “compromising position” with a resident in December 2015. When approached by the administrator, the cook and resident both said he was treating the elderly woman with a topical cream. The administrator failed to take further action, according to a news report. During another visit by the Agency for Healthcare Administration in April, a resident reported that the same cook had “threatened to beat me up when I asked for milk.” The AHCA soon found that the Daytona Beach facility in question had no written policy and procedures on recognizing abuse, neglect, or exploitation. While experts note nursing home abuse and neglect statistics lag behind fields such as child abuse and domestic violence by two decades, research that does exist points to a continued increase and that these incidents are often underreported. In a study by the NCEA, 44 percent of 2,000 residents interviewed reported they had been abused, while 95 percent said they had been neglected or seen another resident neglected. 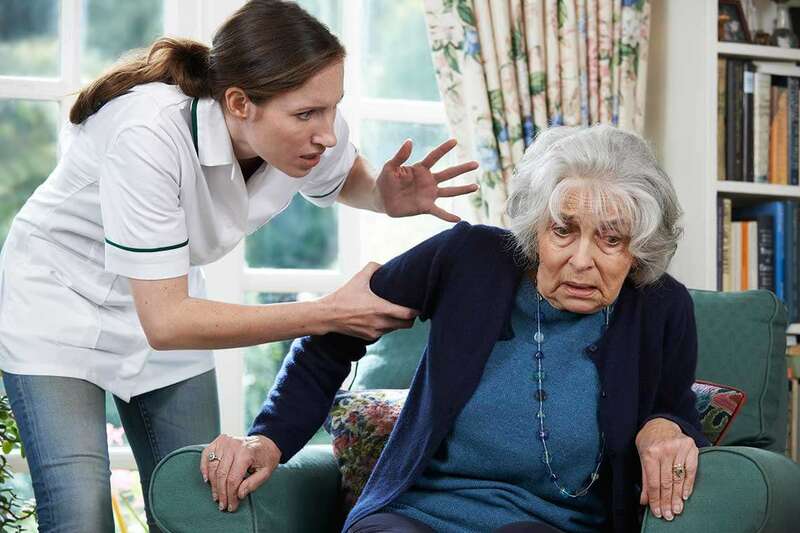 There are various signs that point to elder abuse inside nursing homes, ranging from physical and sexual abuse to exploitation and emotional abuse. Common signs of abuse include bruises, pressure marks, burns, bed sores, poor hygiene, and unusual weight loss, according to the U.S. Department of Health and Human Services’ Administration on Aging. Other signs include unexplained withdrawals from normal activities, bruises around the breasts or genital areas, strained or tense relationships with the caregiver, and sudden change in alertness. Because the elderly are the least likely to report elder or nursing home abuse, it is important for families to be alert of such incidents. Should you notice changes in your family member’s personality or behavior, seek help. The first step to take when suspecting abuse is to immediately report it. Whether it is to the facility’s administrators or an agency, such as Adult Protective Services, which handles abuse, neglect, exploitation, and self-neglect through a hotline. It’s also important that friends and family members visit on a regular basis to keep tabs on how the senior is doing. This also offers a chance to give the caregiver a break. Lastly, you can take legal action if your loved one is a victim of abuse and neglect. To learn more about abuse and neglect, and what an attorney at Morgan & Morgan can do for you, visit our nursing home and elder abuse page.